"Workers install an electric car at a car company in east Chinas Shandong province, 27 October 2013. " China’s volatile electric-car industry might have reached a turning point in February, as sales showed their first signs of recovery following policy changes aimed at curbing government-subsidy cheats. Sales of new-energy vehicles, including electric cars and hybrids, grew by 30% in February from a year earlier to 17,600 units, much better than the sales of only 5,700 a month earlier, according to the China Association of Automobile Manufacturers (CAAM). The pullback in January was due to a sudden government move in December to re-evaluate the catalog of vehicles eligible for incentives, affecting nearly 2,200 models. The government canceled the subsidy list at the time and created a stricter incentive plan that raised the requirements that automakers had to meet to receive subsidies. The sector was in limbo until the government published its revised list in late January. 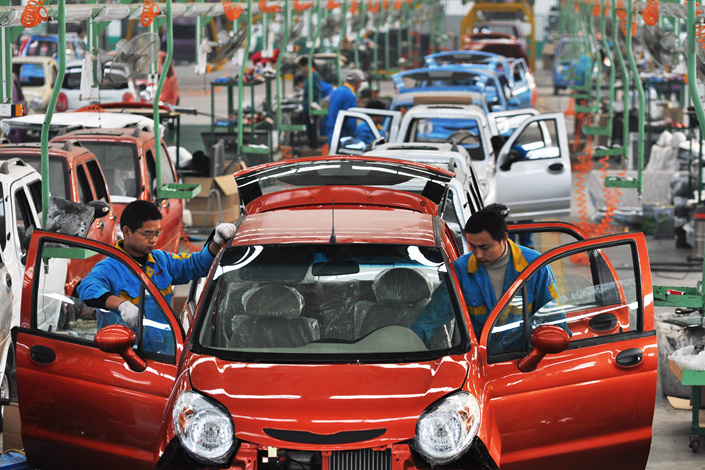 Electric-vehicle producers in the country benefited from incentives of up to 55,000 yuan ($7,950) per unit, allowing them to offset costs and boost production. But some collected hundreds of millions of yuan that they weren’t entitled to after inflating the number of vehicles they had made. On Jan. 23, the first new batch of subsidized electric vehicles was announced, covering 185 models. The pickup in sales in February indicates that the market has taken a turn for the better, and other related sectors such as battery and lithium mining will grow as well, said Tan Qian, an analyst at Sealand Securities based in Beijing. As more electric-vehicle models are included in the incentive program, lithium battery sales will rebound and go up, battery maker Sichuan Chengfei said in a Shenzhen Stock Exchange filing Wednesday. On March 1, the second group of 201 models of new-energy vehicles eligible for subsidies was announced. Growth in the industry can be expected, as the catalog will keep being extended, said Qiu Xiaofeng, a Shanghai-based analyst at China Galaxy Securities Research. CAAM Deputy Secretary General Xu Yanhua estimated that total sales this year will reach 800,000, 58% more than 2016.